Volterra is a walled town in Tuscany with medieval and Renaissance buildings, a Roman theater, and Etruscan sites. It's one of Tuscany's most evocative hill towns but usually, has far fewer tourists than nearby San Gimignano. Volterra is in central Tuscany, a little south of San Gimignano and west of Siena (see Tuscany Map). It's about 50 kilometers from Florence and a little over 200 kilometers from Rome. The closest train station is in Poggibonsi, north of Siena, so to get to there, you can take the train to Poggibonsi. Buses connect Volterra with Poggibonsi and other Tuscany towns. The closest airports are in Rome, Pisa, and Florence, see Italy airports map. San Lino Hotel is a 4-star hotel in a former 15th-century convent inside the medieval walls. Villa Porta all'Arco is a 3-star hotel just outside one of the town gates in walking distance to the historic center. Roman Theater, Forum, and Baths: Construction started on the Roman Theater in the 1st century BC. Behind the theater are remains of Roman baths dating from the 4th century AD. There are also remains of the Roman forum. During the middle ages, these sites were part of a rubbish dump and were buried until excavations began in 1951. Piazza dei Priori: The main square is one of the most impressive in Tuscany. 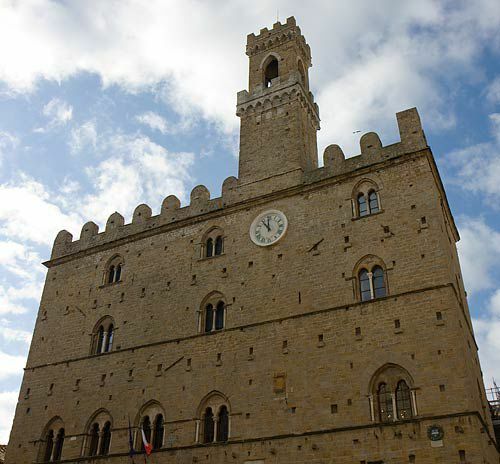 On the piazza is the 13th century Palazzo dei Priori, the oldest town hall in Tuscany. Also on the piazza are the 14th-century Palazzo Vescovile and the back of the cathedral. Cathedral and Baptistry: The duomo, or cathedral, dates from 1120 when it was constructed on the site of a previous church. It has a Romanesque facade and an entrance added in the 13th century. The interior was modified in the late 16th century in Renaissance style and has a richly decorated ceiling and several chapels with frescoes or wood panels and a 12th-century marble pulpit. The octagonal Baptistery dates from the 13th century although parts of it may be older. Its facade is decorated with green and white marble stripes and the dome dates from the 15th century. Medieval Wall and Gates: 13th-century walls enclose the historic center. There are six gates in the walls into the center, dating from the 13th to 16th centuries. Porta San Francesco still has traces of the original frescoes. From Porta San Felice there are views of the countryside beyond the town. Two fonts have also been preserved. One of them, Fonte di Docciola, was used in the middle ages to provide water for mills and the wool industry. Near San Felice fountain, built in 1319, are remains of the Etruscan wall. Etruscan Sites: At the highest point of Volterra is the Etruscan acropolis with panoramic views of the surrounding countryside. The archeological site is part of a park that includes foundations of two Etruscan temples, dwellings from the Hellenistic period, a system of cisterns, and medieval tower ruins. Porta All' Arco, the Arch gate, has sides possibly dating back to the 5th century BC with the arch and heads dating from the 3rd to 2nd century BC. Etruscan tombs, carved into sandstone below the ground, can be found in several places. Museums: The Guarnacci Etruscan Museum, founded in 1761, was one of Europe's first public museums. The large collection of artifacts is housed in the 13th century Palazzo dei Priori. The Civic Museum and Art Gallery are housed in the 15th century Palazzo Minucci-Solaini and include paintings and artworks from medieval to modern times. A Museum of Sacred Art is housed in the Bishop's Palace. Medicea Fortress: The fortress, high on the hill, consists of the Rocca Antica and the Rocca Nuova. Volterra is the home of the Volturi in the New Moon book, the second book in the Twilight series, and action at the end of the story takes place here. Although the ending of the Twilight Saga: New Moon movie is set in Volterra it was actually filmed in Montepulciano.